Get back to the roots of healthy eating with style and whole food. Forget the long list of unrecognizable ingredients like vegan faux cheese or meat substitutes; with this cookbook, readers use only the freshest, whole natural foods around. After all, that's pretty much the only thing available to Kathleen Henry up in Alaska. The recipes in Pure and Beautiful Vegan Cooking are delicious enough to be gourmet, but simple enough to whip up on a weeknight. Come morning, you won't want to sleep in when you've got Caramel Oat Pancakes, or nutrient-packed Flax & Quinoa Blueberry Porridge. Off to work? Don't forget your lunch! Your coworkers will be eyeing your bowl of Aromatic Coconut Lentil Soup or "Tuna" Waldorf Salad Sandwich made on Perfect Homemade Sandwich Bread. Over dinner, your family won't be able to stop talking about the Kale Stuffed Balsamic Sage Sweet Potatoes or the Unbelievable Chow Mein. If you saved room for dessert, you're in for a real treat with Ginger Blueberry Citrus Crumble or Chipotle Chocolate Silk Pie. Finish off the evening with a round of Vintage Strawberry-Basil Shrub cocktails and you'll feel like you're in foodie paradise. No matter whether you're vegan, vegetarian or just a fan of delicious, healthy food, the 80 incredible recipes with 80 stunning photographs in Pure and Beautiful Vegan Cooking will catch the eye and get the taste buds tingling of every food lover out there. 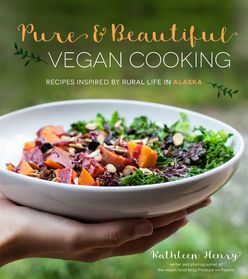 Plant-based recipes made from simple, whole ingredients, inspired by what's available in Alaska; no expensive and processed or specialised vegan alternatives.